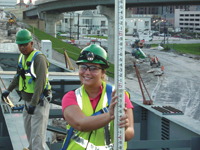 CEM major Jennica Greffe hit the highway last summer, gaining real-world experience in Orlando, Fla.
Few student resumes boast: "Overpass, on-off ramp construction engineering management intern, Interstate-4/State Road 408, Orlando, Fla."
Jennica Greffe's does. Now a junior, she'll have three such experiences by graduation. "Incredible" is how she defines the value of internships. "In class, you learn theory. In the field, you have to think on your feet and know how to interact with people." That's exactly what she did for 13 weeks in summer 2008 in her second Florida internship with construction giant PCL, a Canadian company. "Jennica interfaced really well with everyone on the team. She did a really good job," says her supervisor, Jim Holtje, PCL project engineer and one of about 180 PCL employees in Orlando. PCL regularly offers internships, he says. "We give students experiences with our company and we get experiences with them. They can learn about us; we can learn about them. That's the whole goal." Interns are members of the PCL team, he says. "We try to give them a lot of rope and responsibility. They're really productive members of the team." For Greffe, the experience enhanced her classroom learning. "I learned so much; I can't even put it into words," she says. "I was in the field every day. I learned a lot of technical things. I learned how to deal with subcontractors and the three different owners—the city, state, and tollway division. I operated a cherry picker and saw how concrete was poured up on bridges." She also worked on change orders and reporting aspects of the project. Born and raised in DeKalb, Illinois, Greffe was hooked on Purdue from her visit on a preview day. A computer design class convinced her that computing wouldn't be her engineering interest. "I wanted to be hands-on and outside," she says. CEM fills the bill. While women are few in her field—"that can be daunting," Greffe says—she found the Orlando crew to be a real team. "Everyone worked together and was willing to help anyone out."